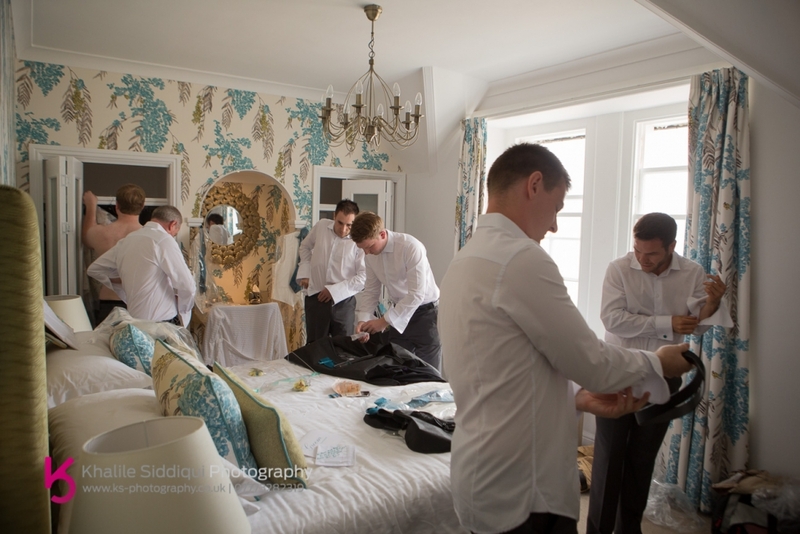 Emma wanted to do her own makeup but thought that she'd treat her three lovely bridesmaids by getting Tamsyn to do their makeup, so after dropping her off, I headed over to the main hotel to catch up with the boys getting ready. 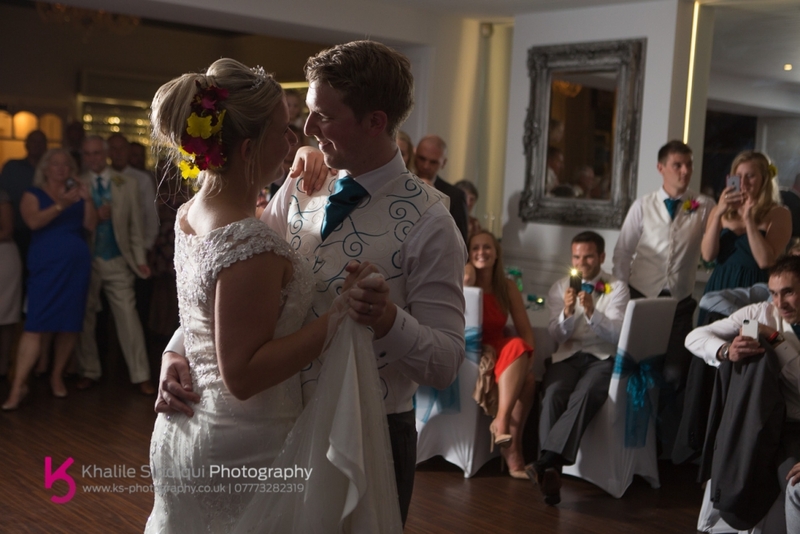 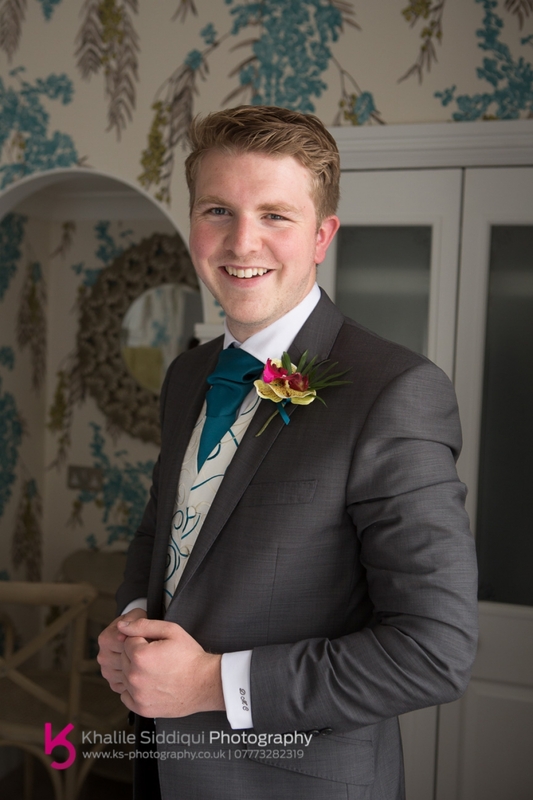 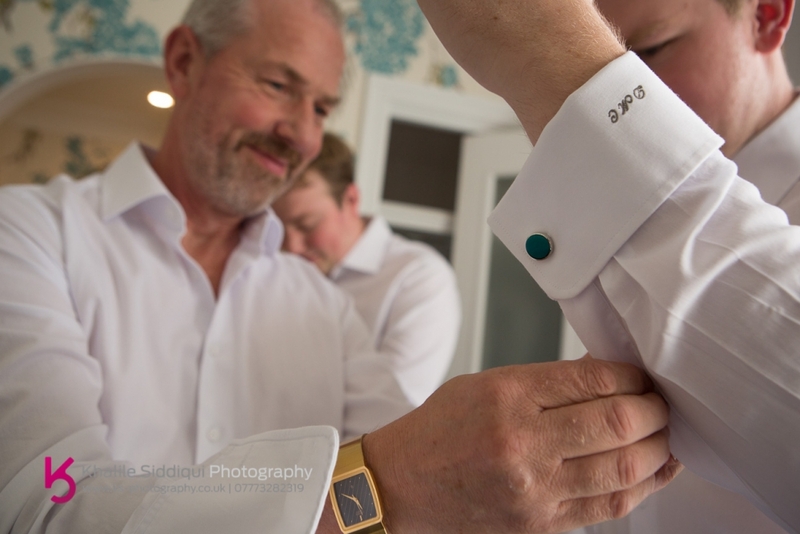 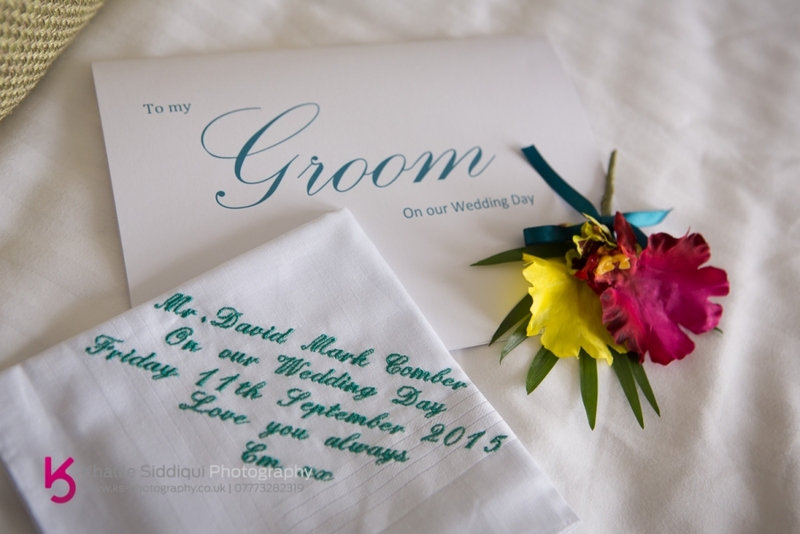 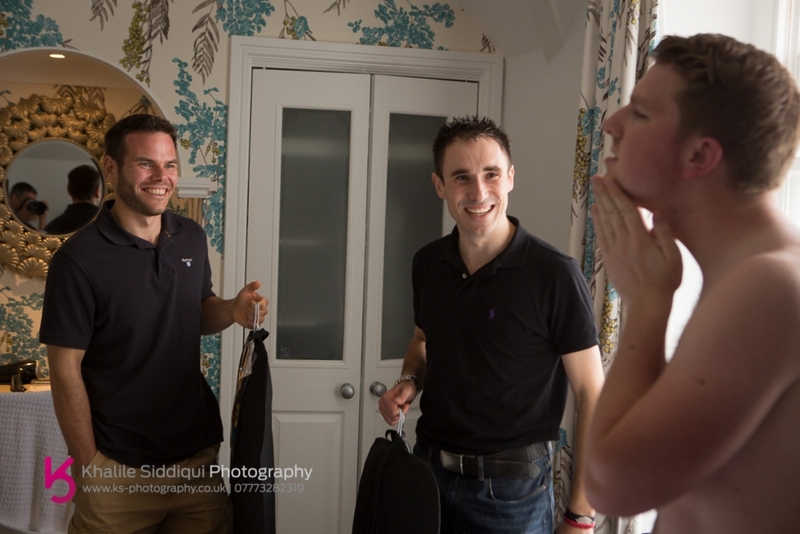 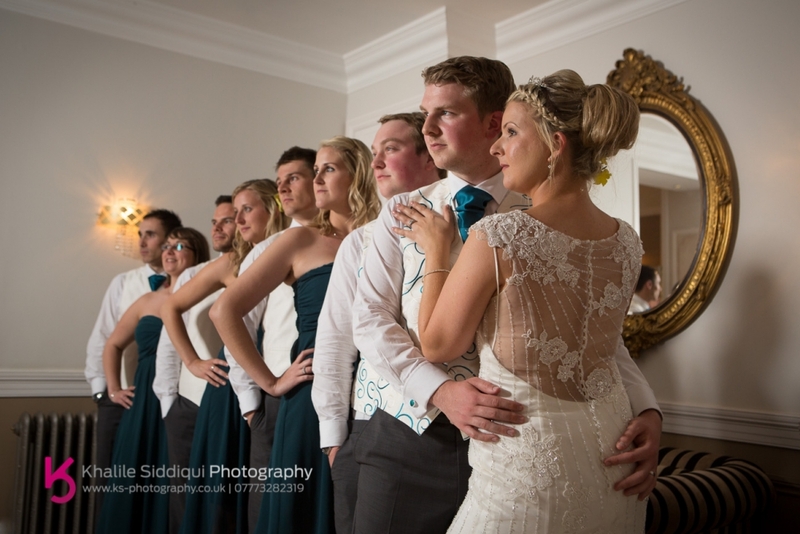 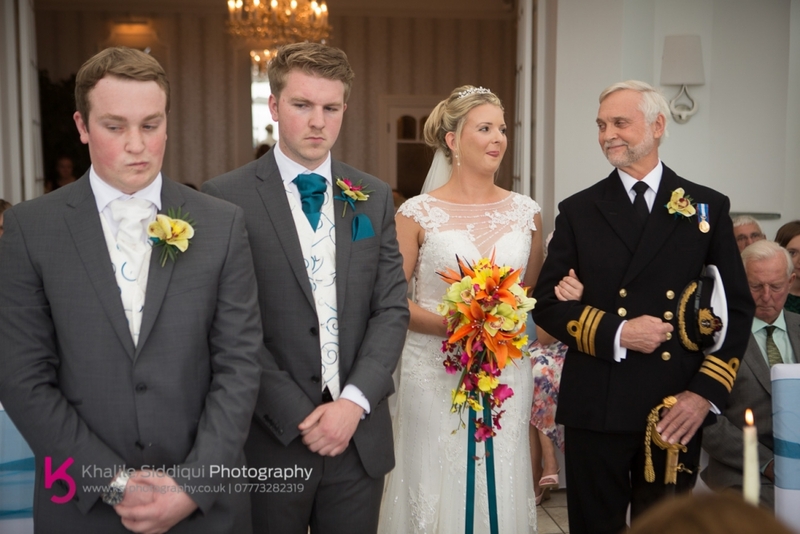 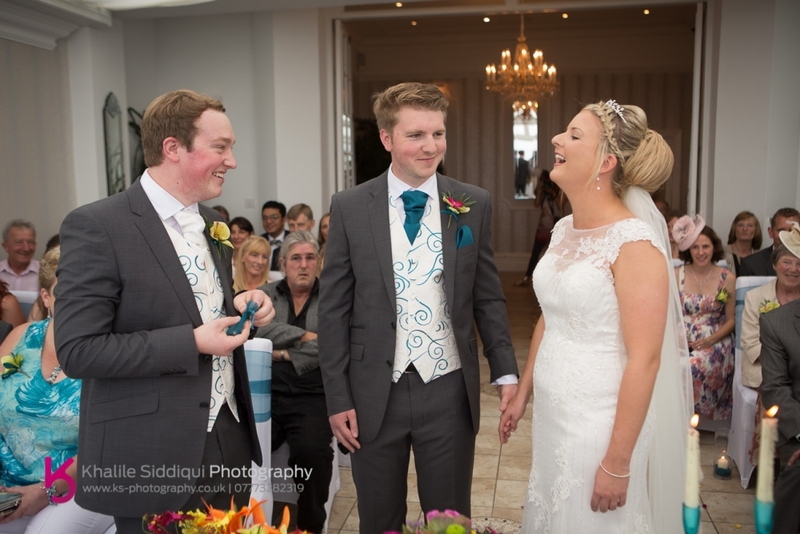 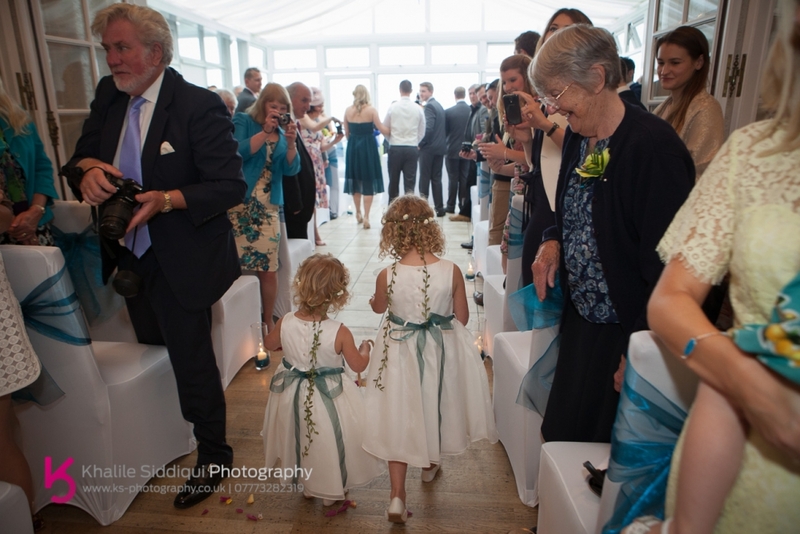 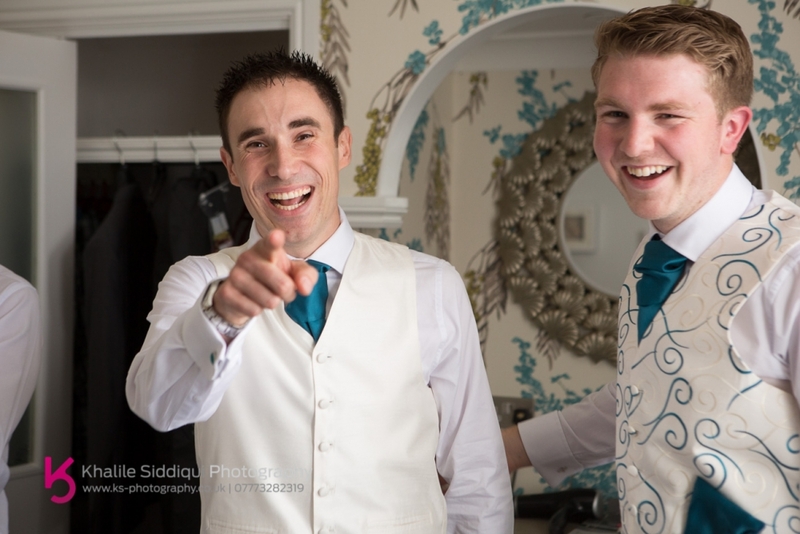 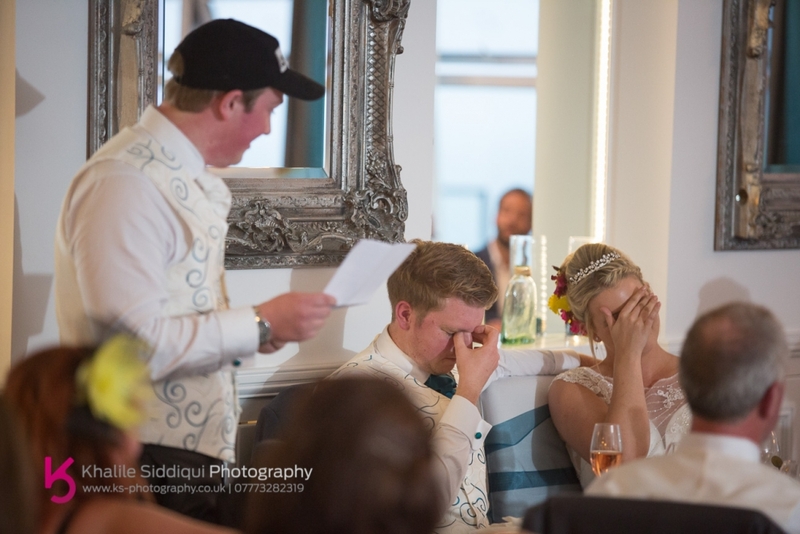 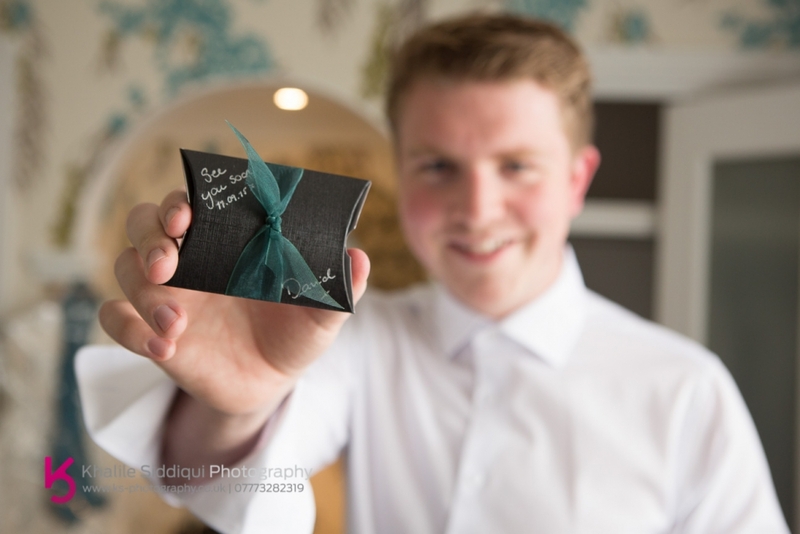 I thought that this was a nice touch, to make sure know one put the wrong shirt on, and to personalise one of their many gifts to their bridal party, Emma and David had the gents shirts individually monogrammed. 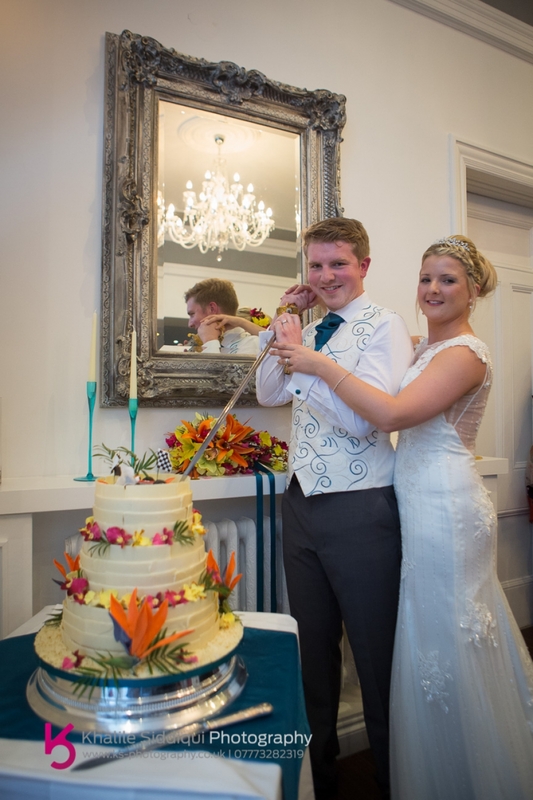 And all of the flowers on the day were made by Emma's mother who does floristry with silk flowers. 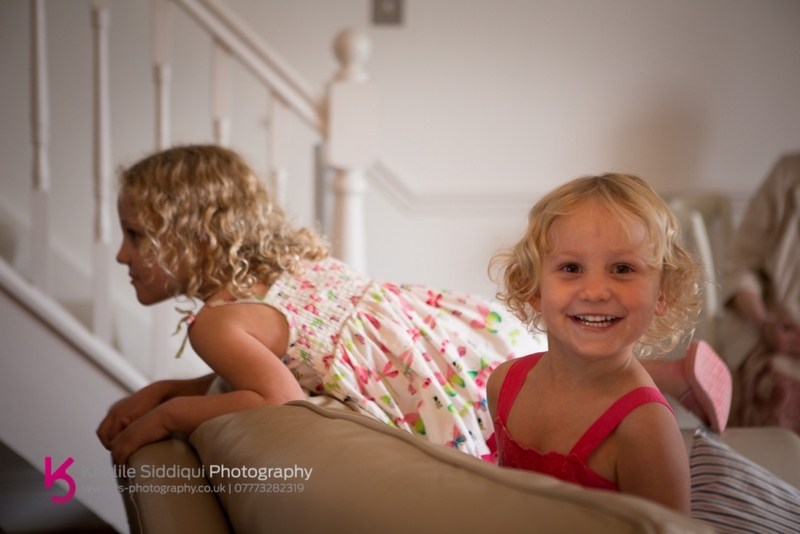 Emma and the girls were getting ready in one of the beach houses right on the beach! 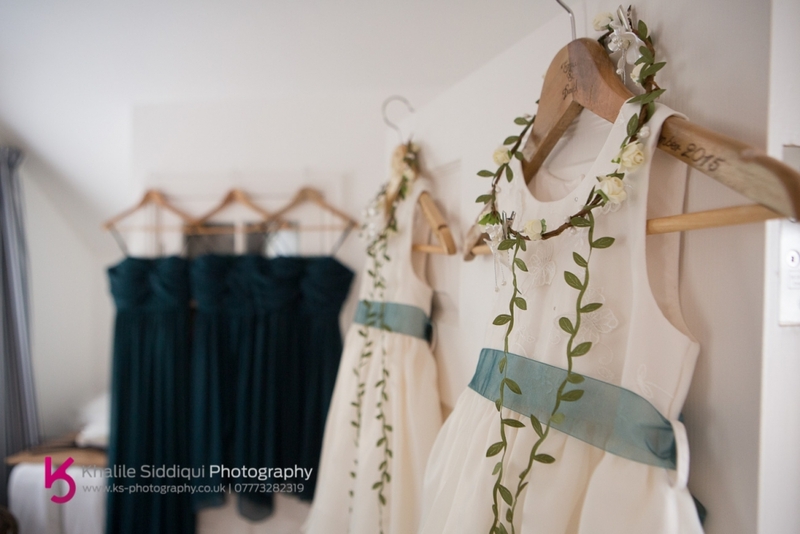 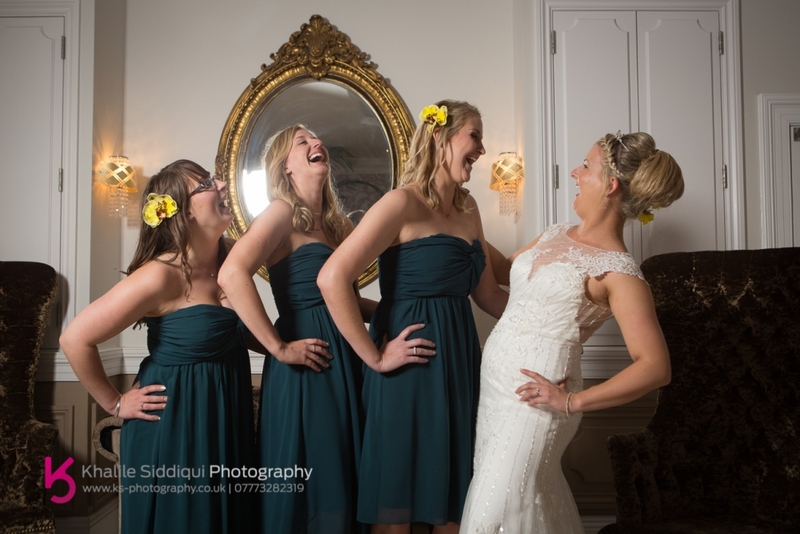 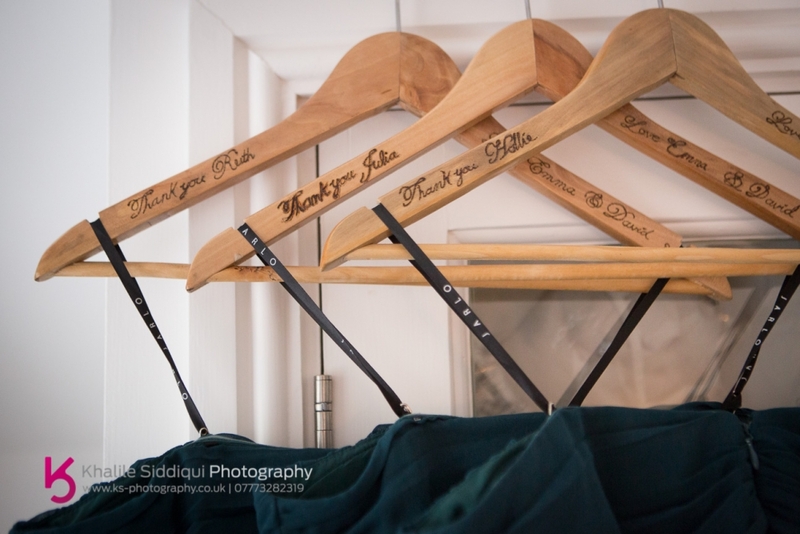 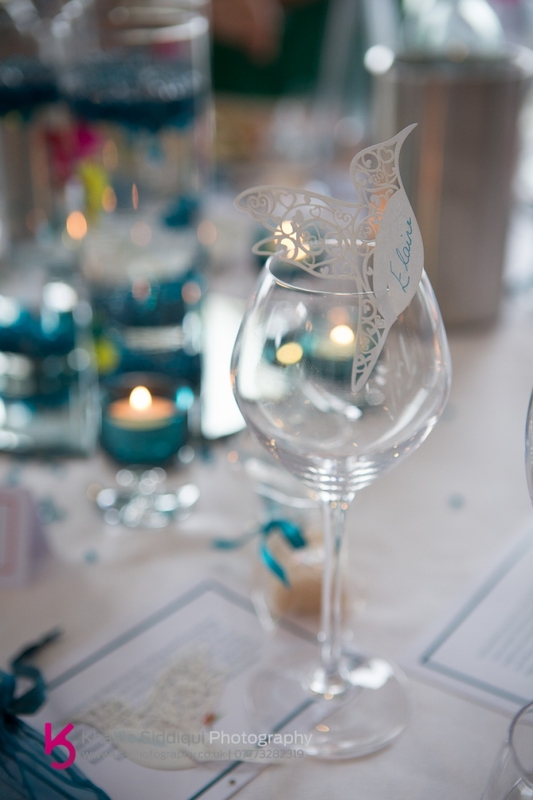 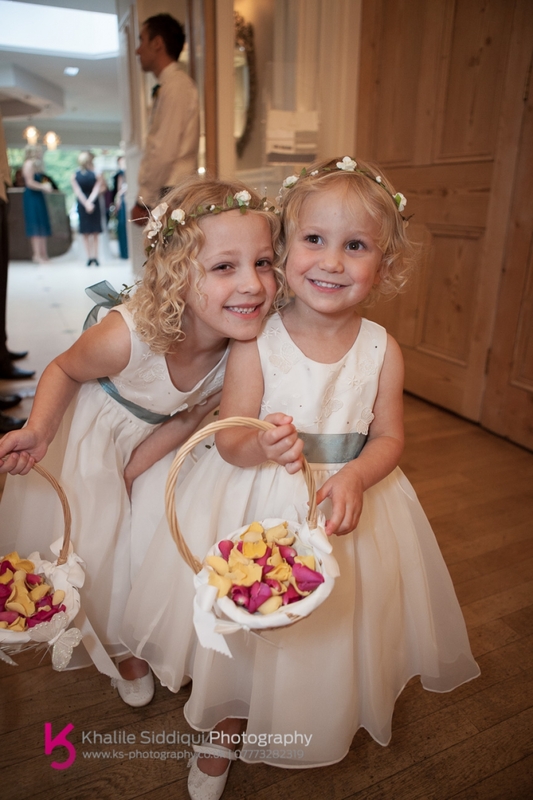 On the personalising front, Emma etched each of the bridesmaids dress hangers too. 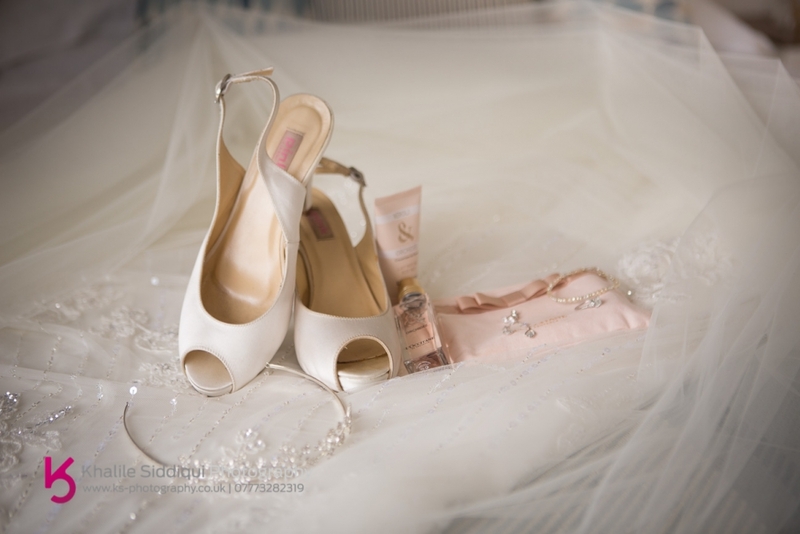 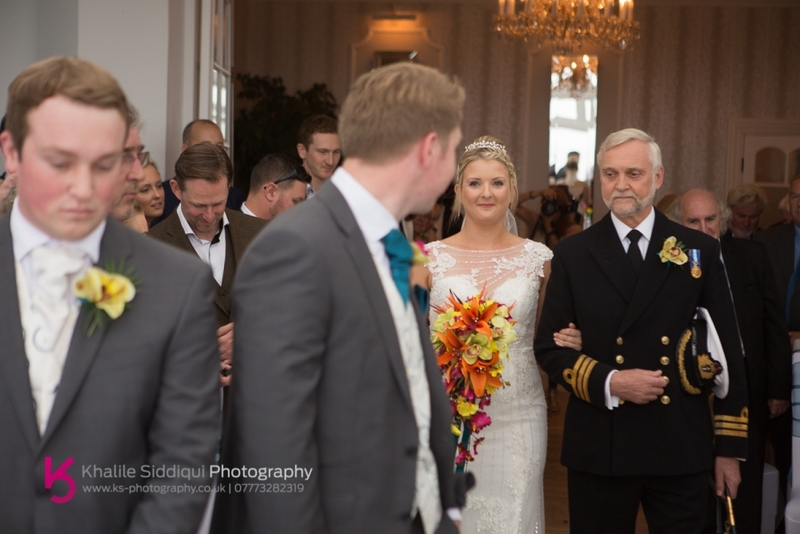 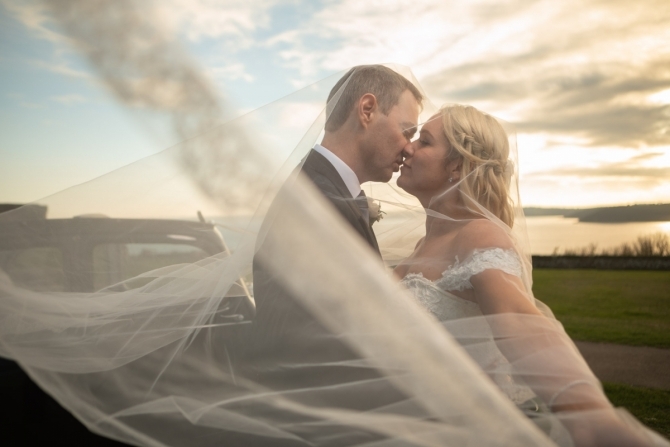 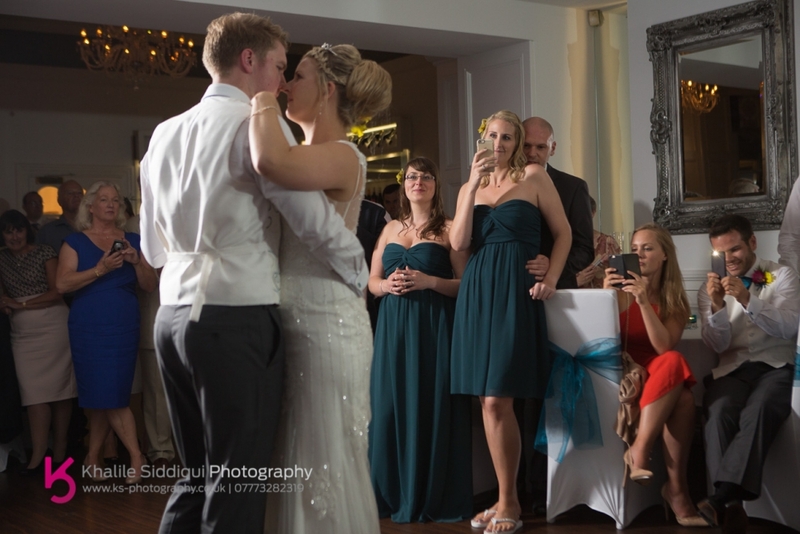 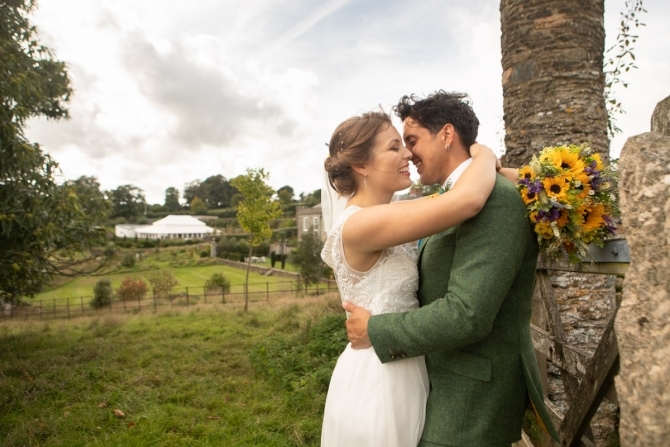 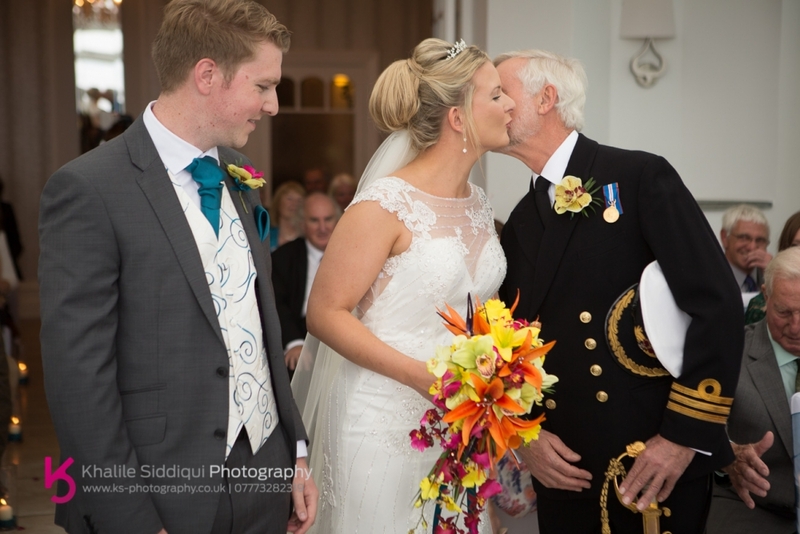 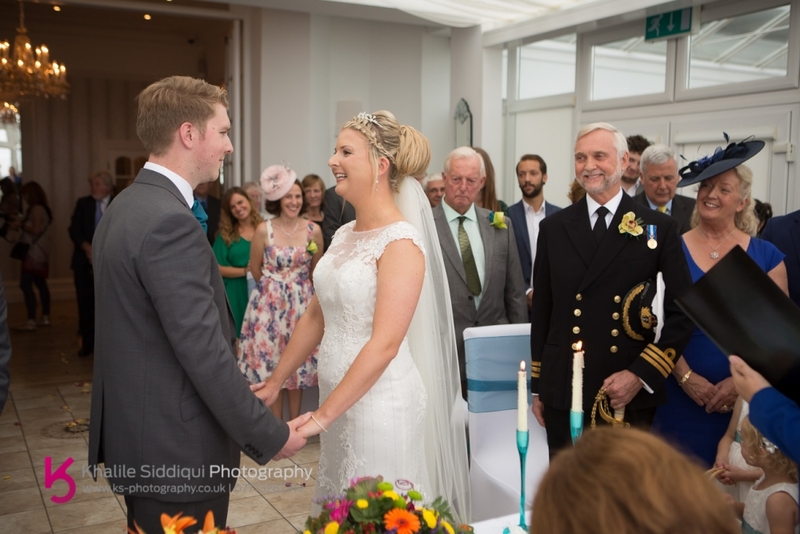 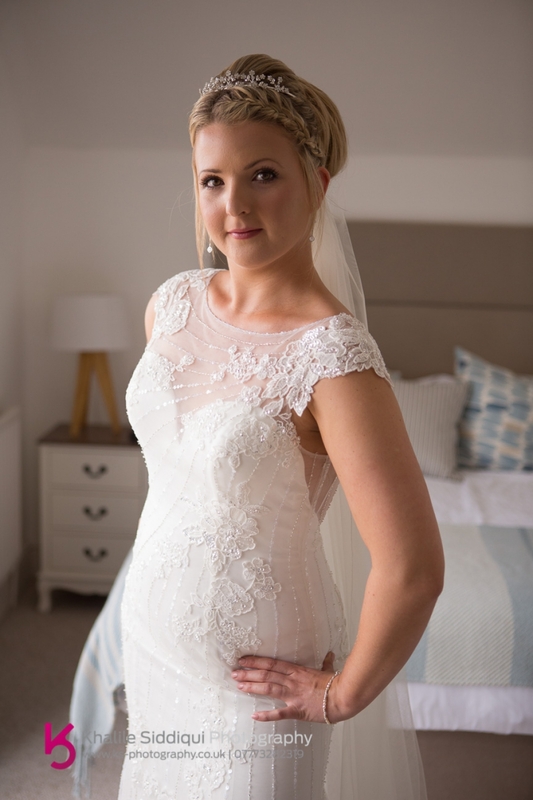 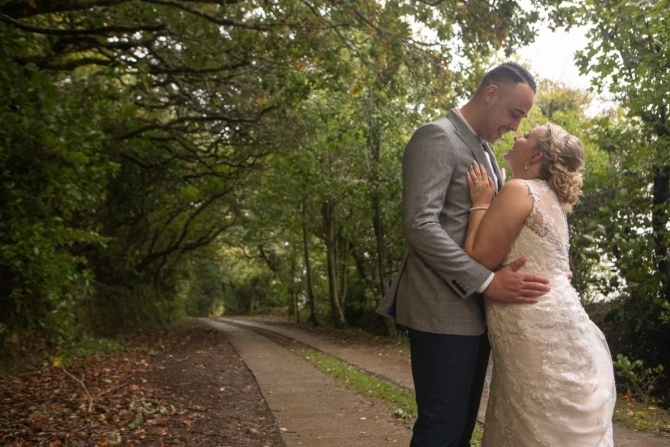 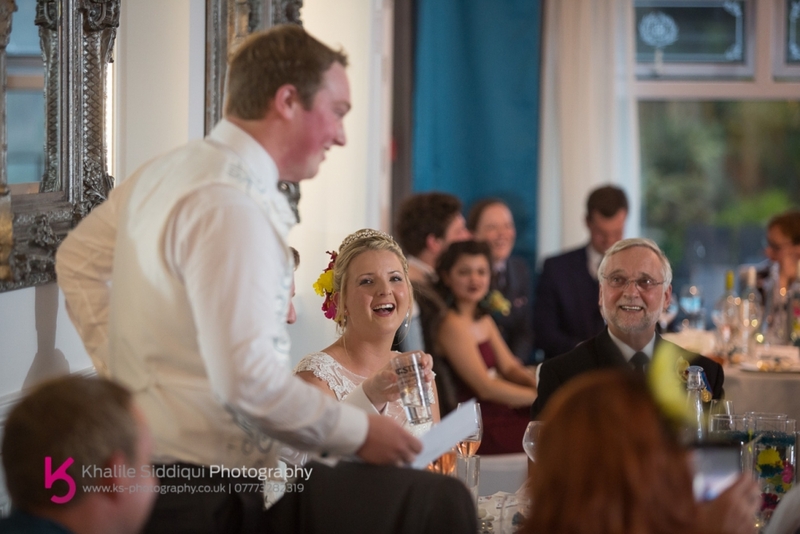 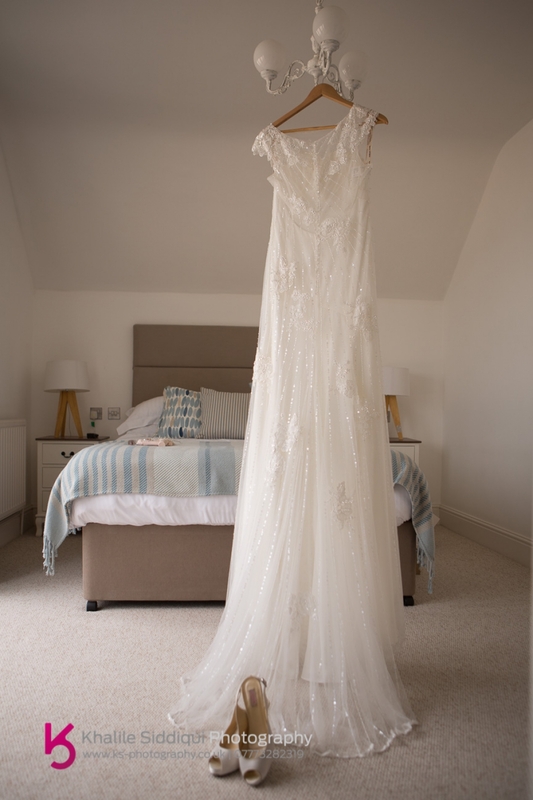 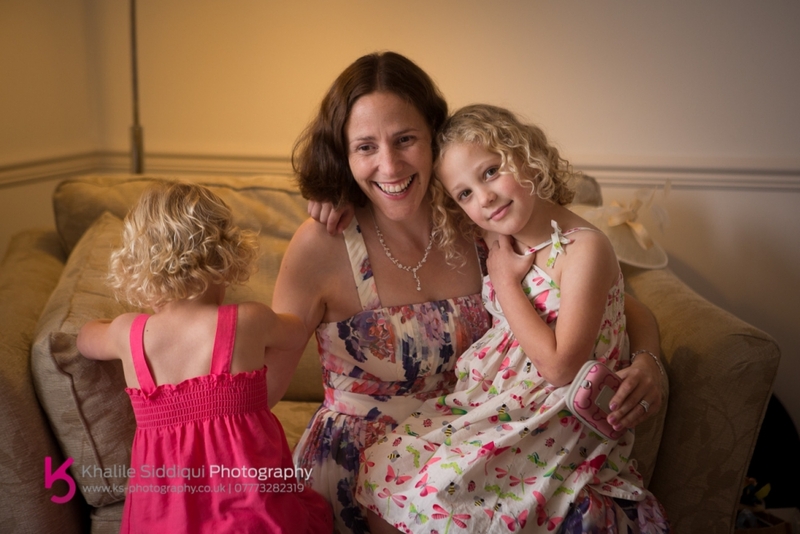 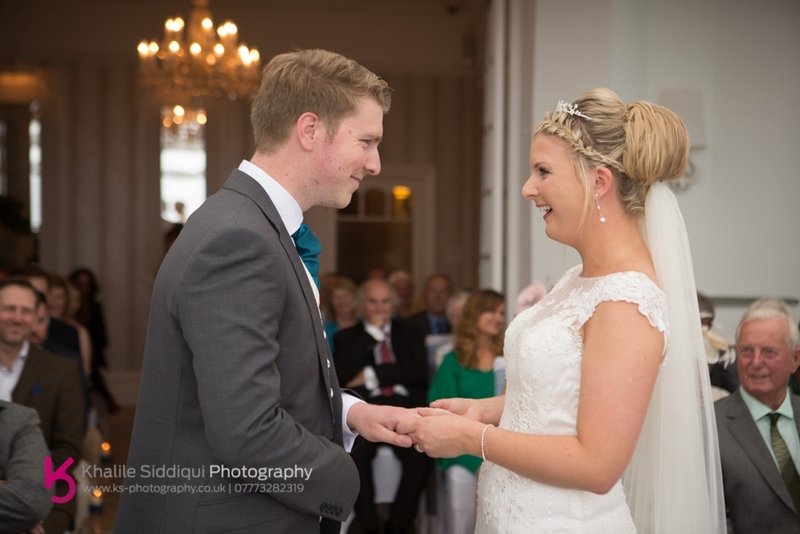 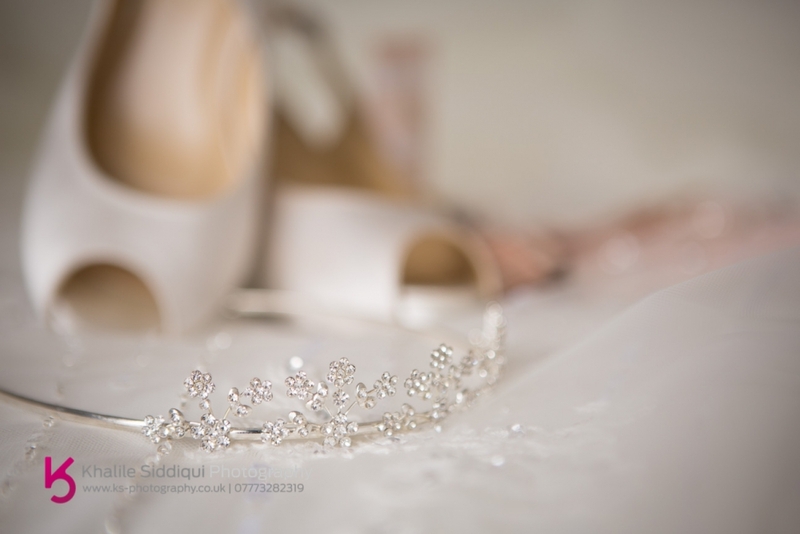 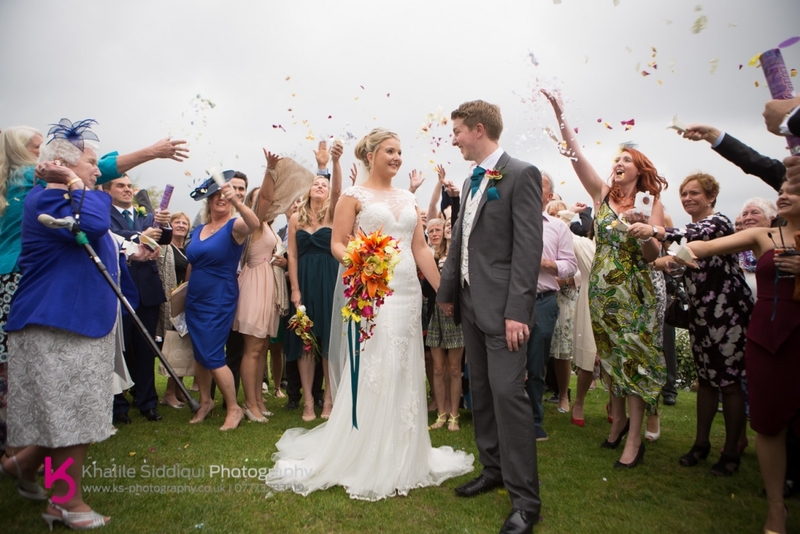 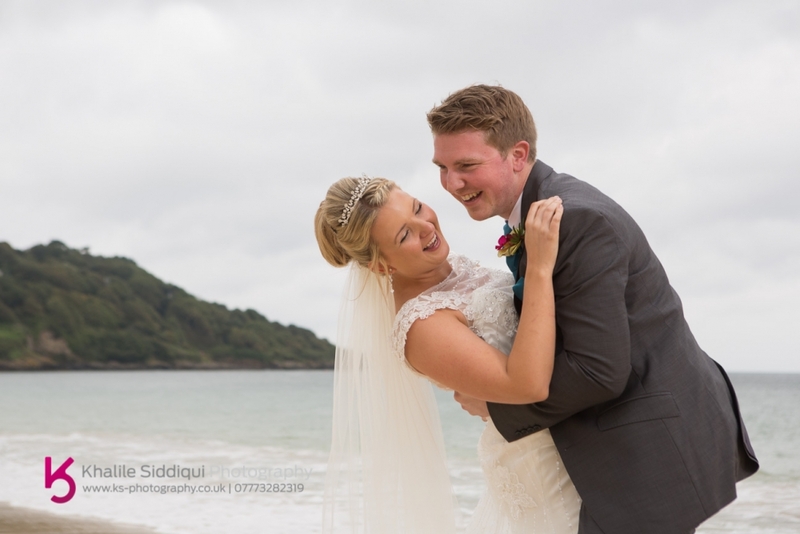 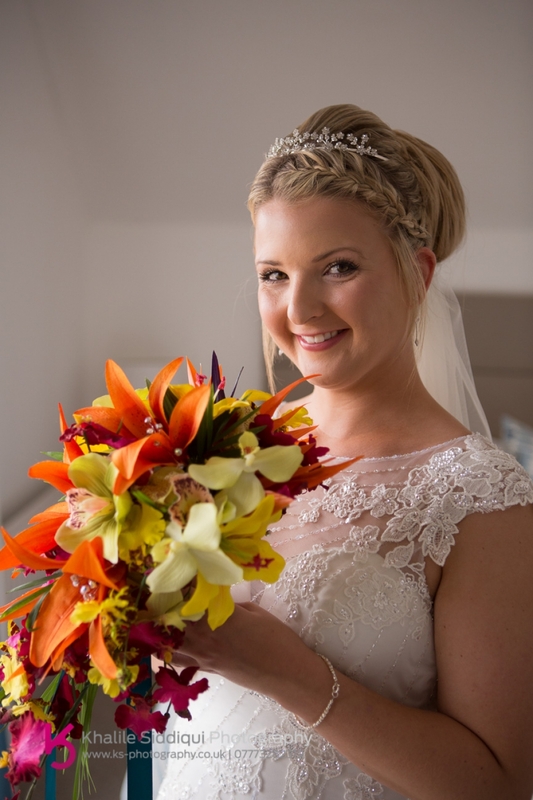 Emma chose an exceedingly elegant Maggie Sottero number for her Bridal gown. 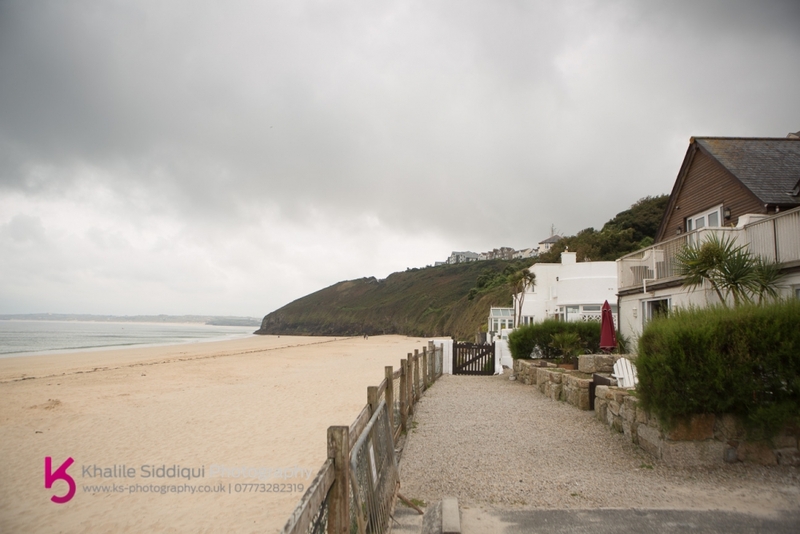 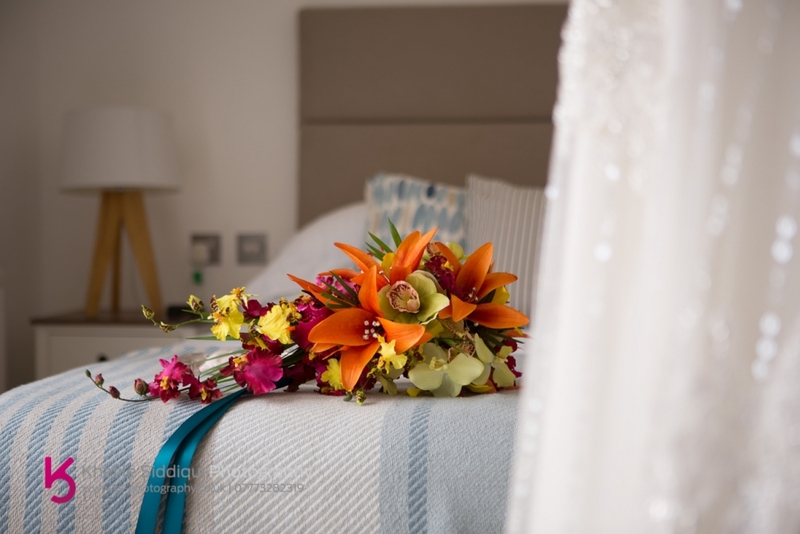 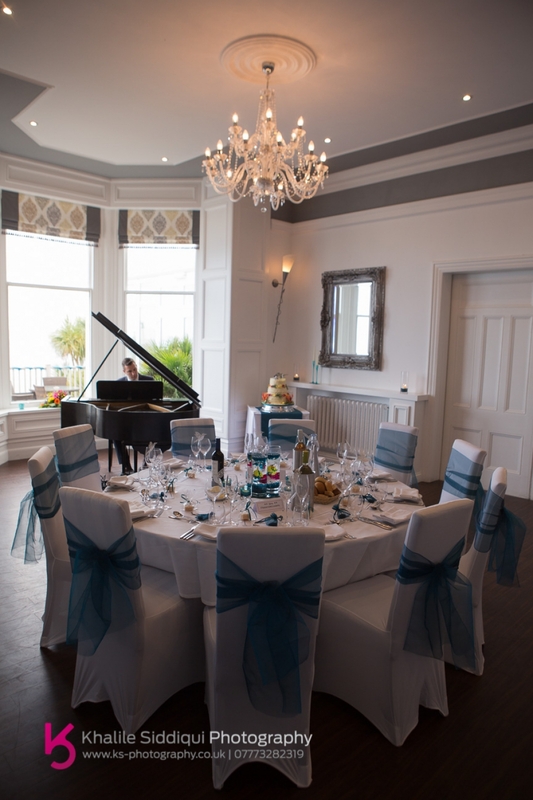 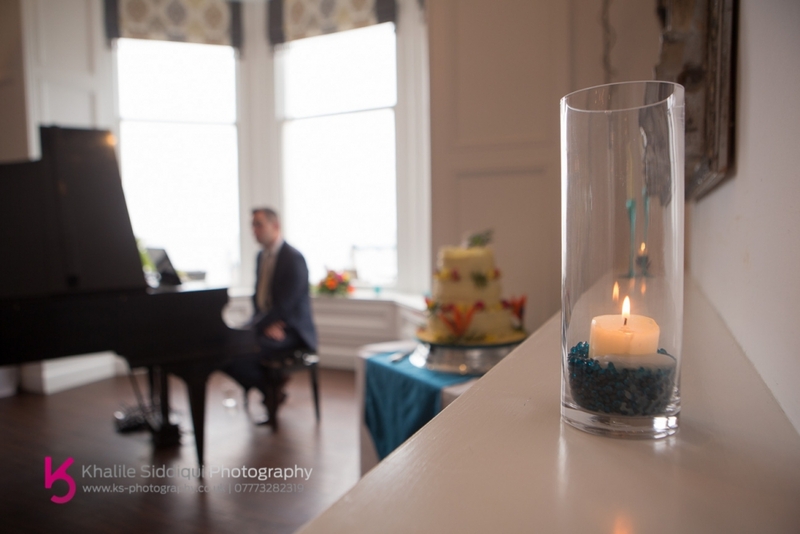 We didn't have very long to do the group shots, so after popping down the beach to get some couple photos before the forecast raging torrent of rain arrived I headed back to the hotel to get some shots of the wedding breakfast room set up. 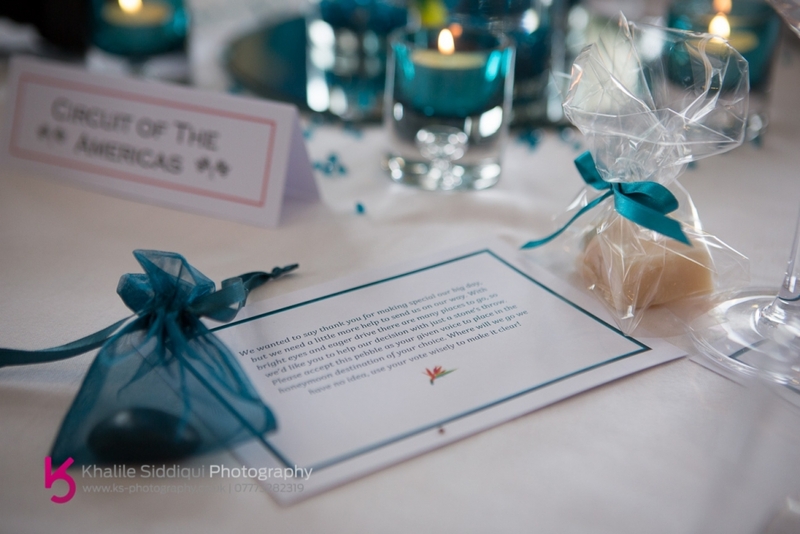 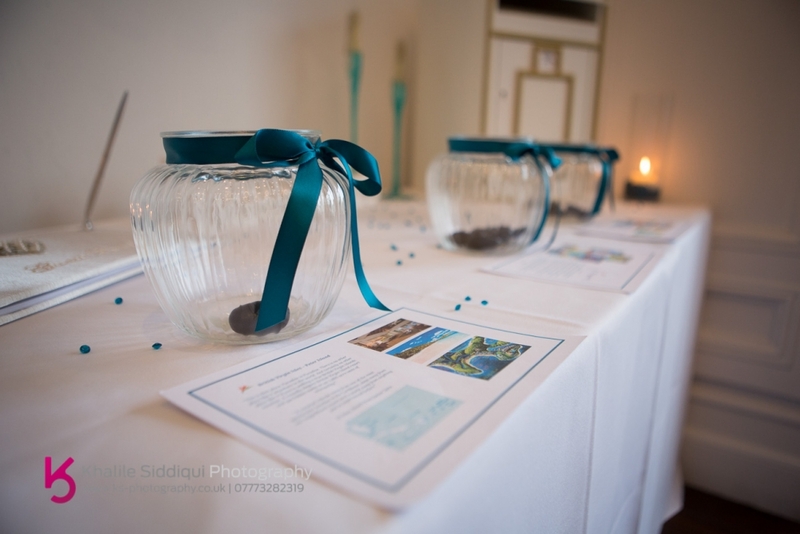 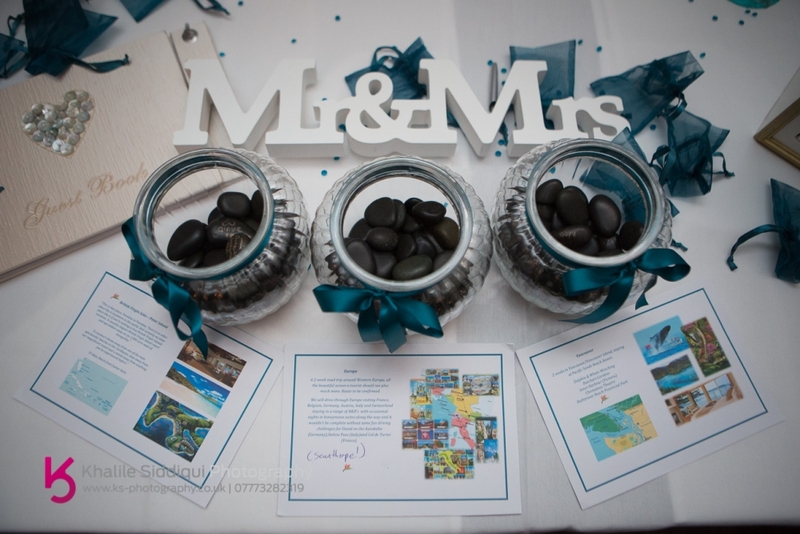 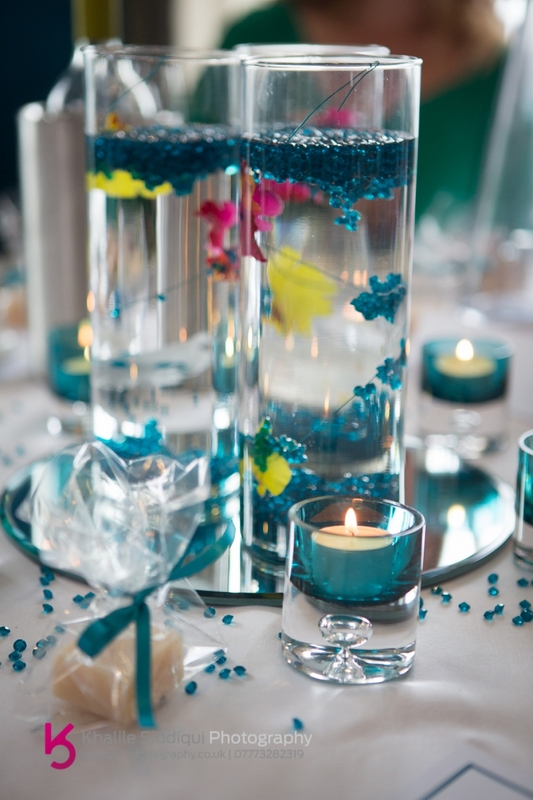 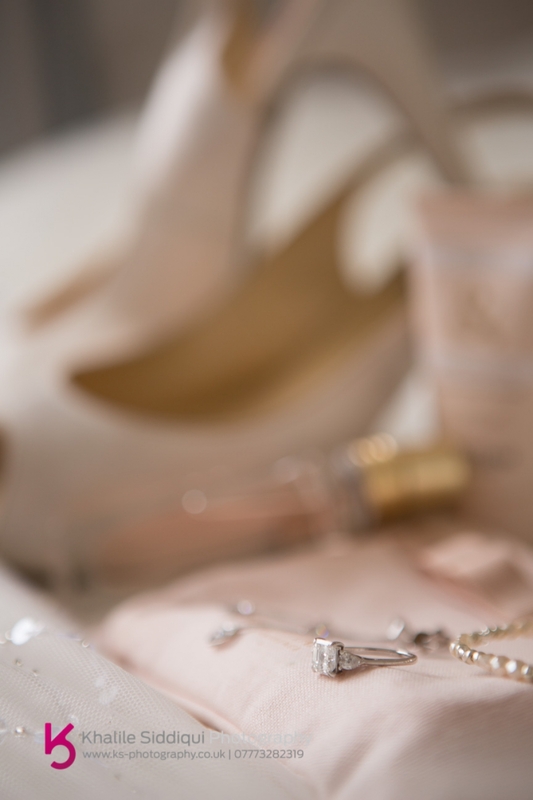 Another one of Emma and Davids lovely ideas was, being as their guests helped contribute to their honeymoon they gave their guests a pebble each and three jars to choose from, each representing a different honeymoon choice, with the decision being revealed later in the evening. 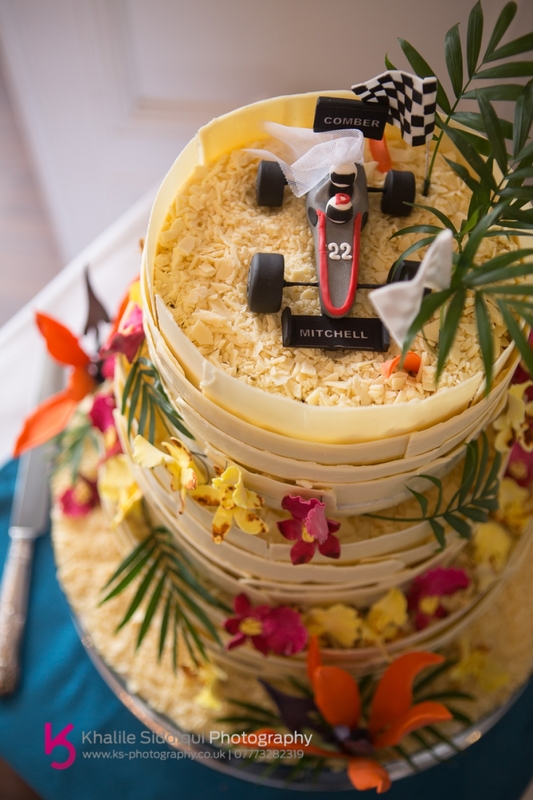 Emma and David went to Clare's Cakes to to get their white chocolate covered cake which was styled with Emma's mum's silk flowers and a Formula One theme to go with Davids idea of F1 race tracks from around the globe for table names, and used Emma's dads ceremonial sword for the cake cutting photo. 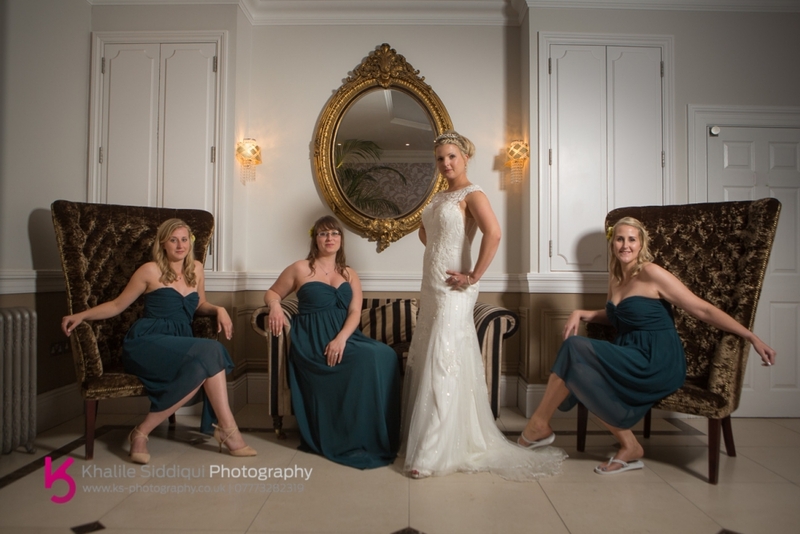 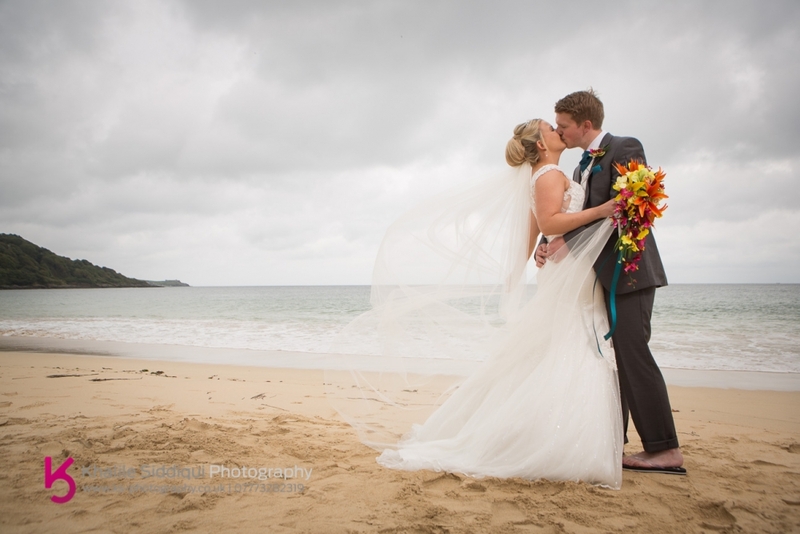 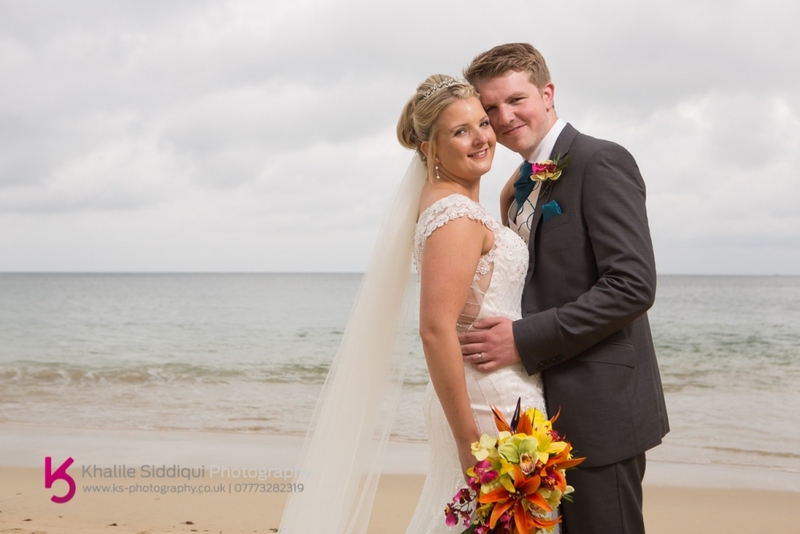 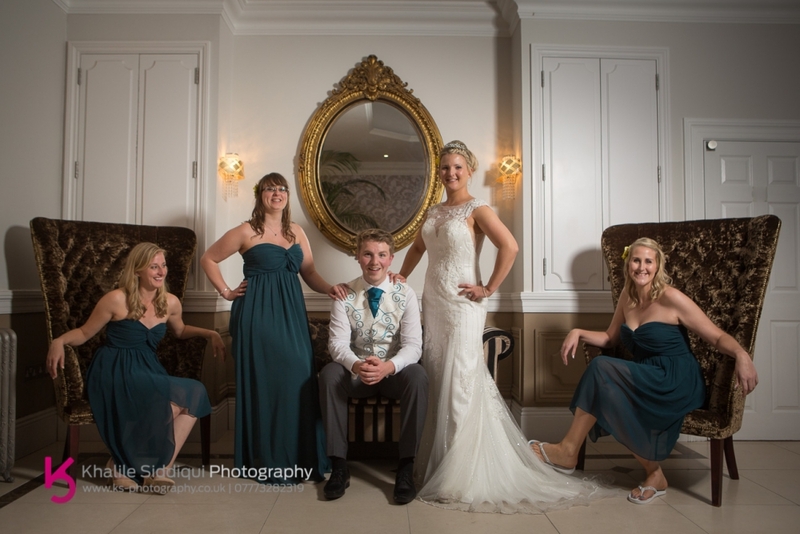 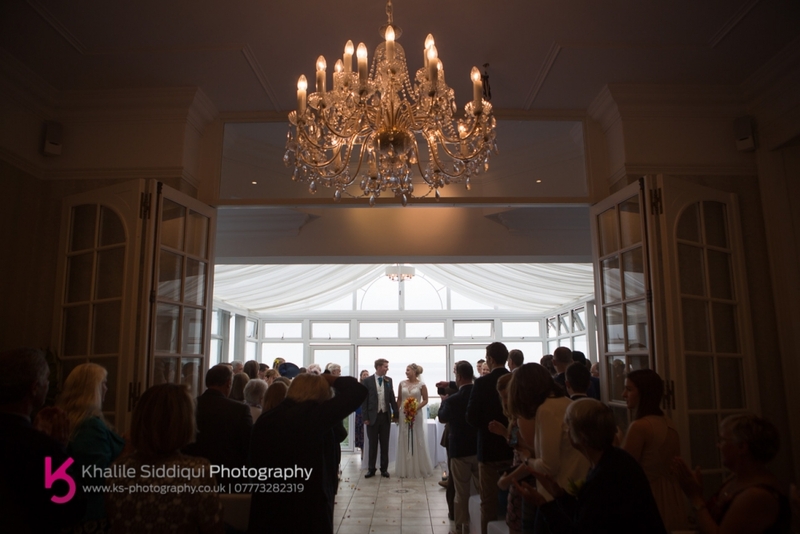 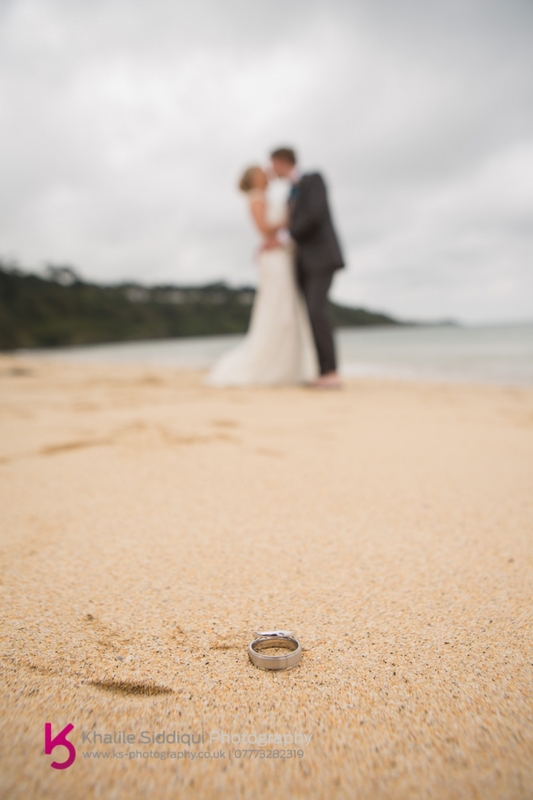 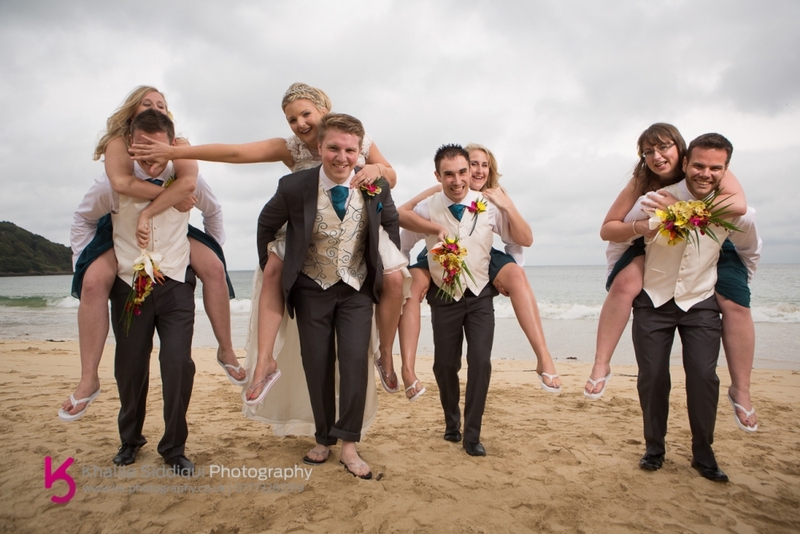 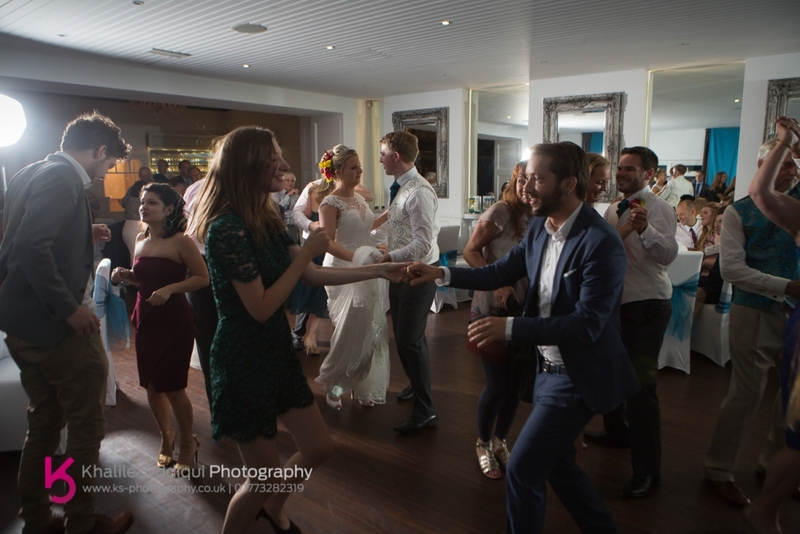 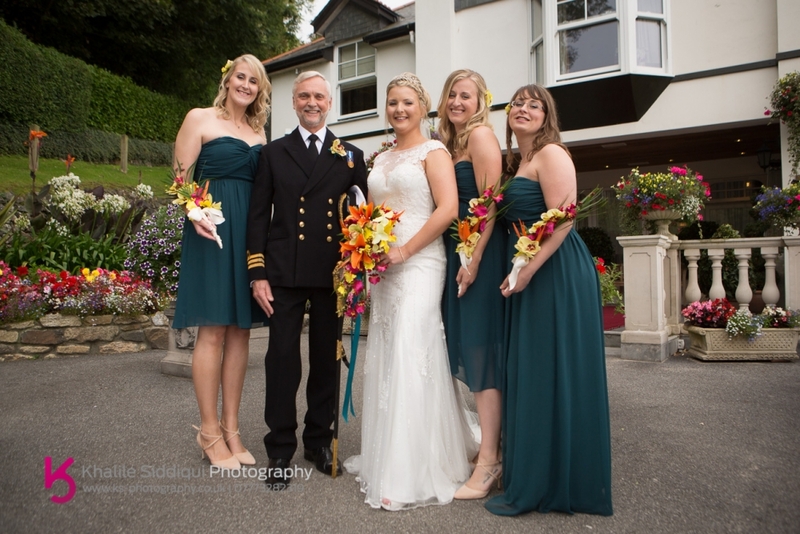 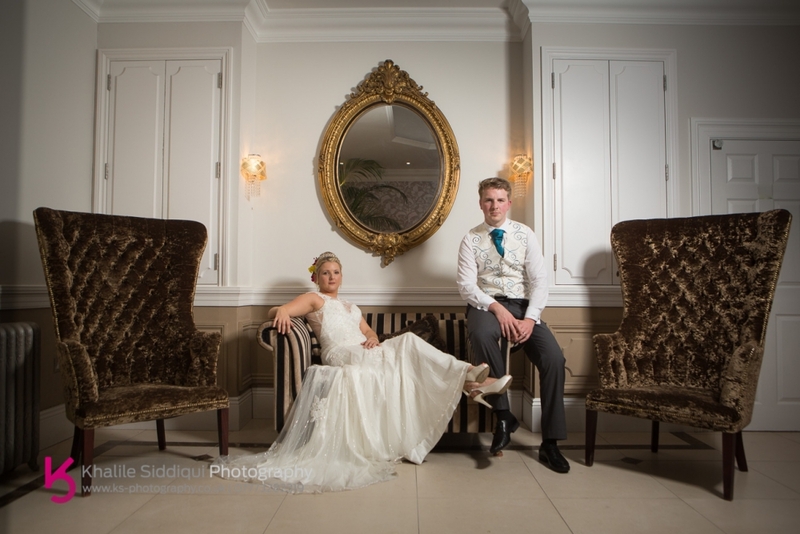 Now, any regular blog readers will know I always prefer to do our couple shots after the wedding breakfast for many reasons, but as the forecast was bang on and it poured down we got the beach one earlier but utilised the ornate but contemporary hotel lobby for a few more couple/bridal party photos. 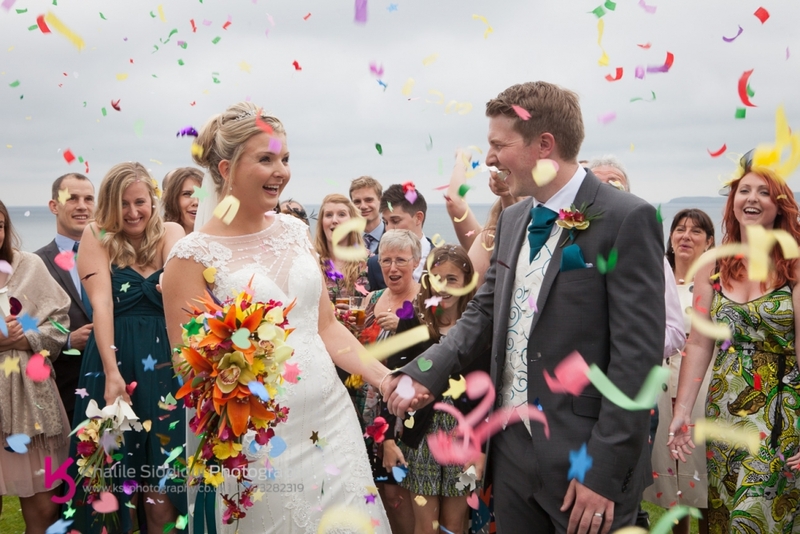 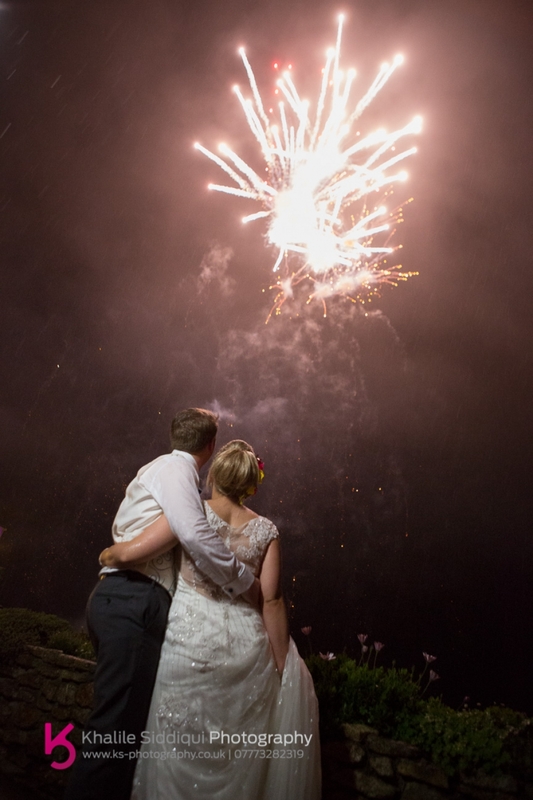 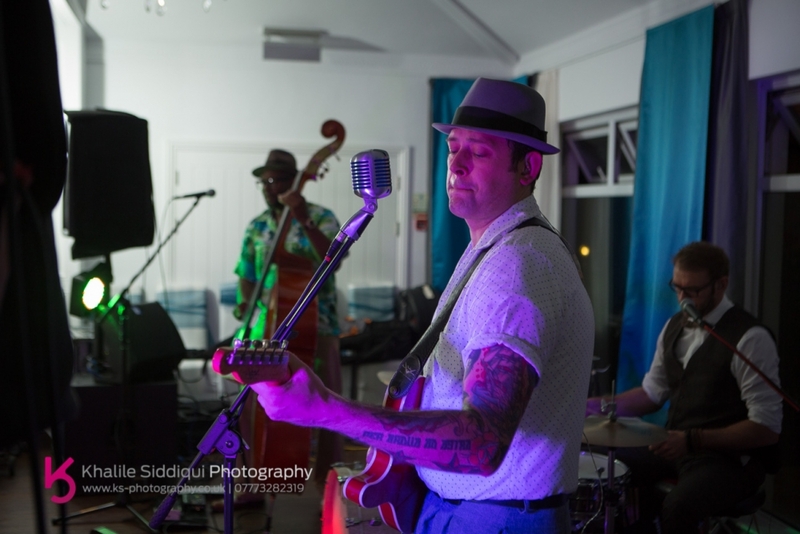 For the evening entertainment Emma and David brought a creative jive band The Jackpots down from Leicestershire for their soundtrack and wowed their guests with nothing if not a soggy firework display (check out the rain in the top left) provided by Kernow Fireworks. 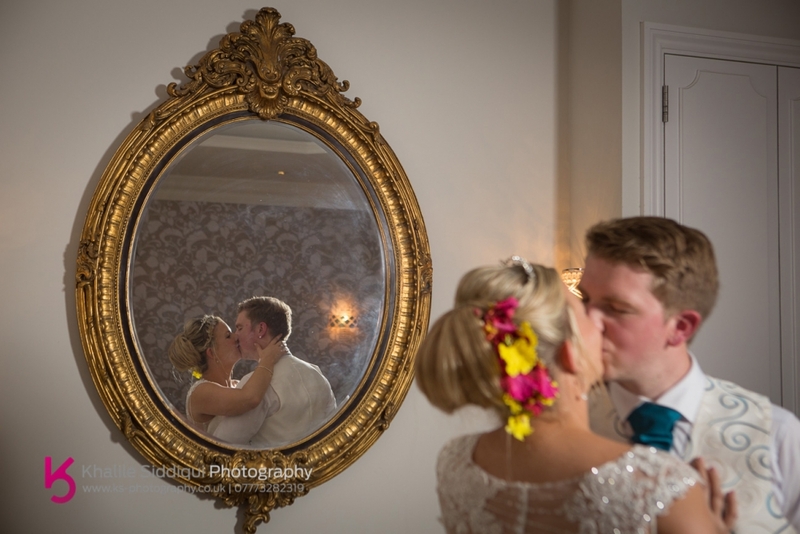 Dearest Emma and David, thank you for a fantastic day, we wish you a long and happy life together, and do let us know what the final result was for the honeymoon, I'd love to know!